The person who posted it, a woman (that we might call Wendy), said that her atheist brother-in-law posted this on his Facebook page. She said that she found the meme silly. But when you stop to think, and consider the context, it really isn’t that silly. Wendy is a Catholic, her brother-in-law is atheist. I do not know if he has been Catholic at one time, but this meme perfectly describes classic Reformed soteriology. According to John Calvin, when Christ offered himself on the Cross (and descended into Hell), Christ underwent a ‘switch’ or a ‘transfer of penalty’ (as Kim Fabricius points out). 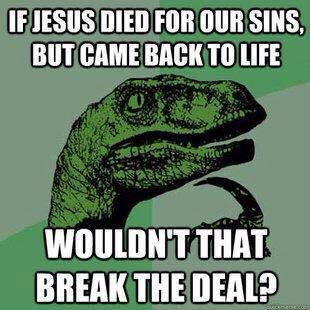 This theory is often called ‘Penal Substitutionary Atonement’ (PSA), and if that is the context to which the meme points, then this meme is to the point. If Calvin’s theory of a ‘transfer of penalty’ is correct, then the resurrection IS a deal breaker. But if we read St. Paul, we see that he actually sees Christ as a representative, offering himself as a gift to God, not as a replacement onto which God can inflict punishment. And then the resurrection becomes rather the seal of the deal.